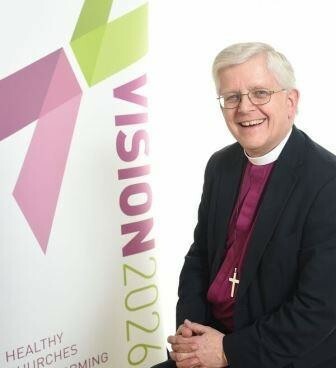 Here is the message from Rt Rev Julian Henderson, the Bishop of Blackburn, in video format first and (following below) the full text as well. I don’t know if it is that I am particularly sensitive at the moment following my mother’s death at the end of February, but I find I am more alert to the events in the news about death. While it is always the case that people die, it seems as though I am more aware of its intrusive presence at this time. Whether that is through horrific acts of knife crime in our cities, or the devasting loss of life through the plane crash in Ethiopia or hurricane Idai or the crush of bodies at a football stadium 30 years ago and back in the news at the recent trial, or an unexpected and unwelcome illness taking the life of a young person, or the conflict in Yemen producing traumatic pictures of lives struggling to stay alive; however it happens death is never far away. It bangs relentlessly on our door and will eventually claim each one of us. There is no escape. It is the ultimate statistic, one out of one dies. And it is into that stark reality that the Christian faith has a unique and powerful message of hope to offer. The Christian conviction is that Jesus died and three days later was raised back to life. His resurrection proclaims that He has conquered death and its sting has been removed. Yes, every earthly life will come to an end and yes, everyone will give account to God of their response to Him during this life. But those who have put their trust in Jesus Christ have been assured of His forgiveness and so look forward with faith to being with Him in the life of the world to come. That glorious hope is offered to all and when embraced transforms life here and where we will be in eternity. That is why faith matters, why Easter matters and why as I wish you a happy Easter I do so in the hope that you will find your way to a service over the Easter weekend, and discover something of the peace and joy that come from knowing and worshipping and serving the risen Jesus Christ. That sums up our confident and assured Christian hope, that death, whenever it comes and it always involves sadness and a sense of loss, is not the end or to be feared, but can be faced with peace and hope, not because of what we have done for God, but because of what He has done for us. And it is because of that resurrection hope that I send my Easter greetings to the people of Lancashire.